Do Odorizzi and Pérez need an Opener? I will be walking on eggshells here, but I think this issue is bound to be discussed each day more. It looks inevitable. I’m not campaigning for the spread of "The Opener" strategy, as if it is a groundbreaking improvement for the game. Honestly, all I can say is that I think there’s no harm in testing it. But that’s not the point of this article. For the sake of a further discussion on whether MLB teams should embrace The Opener or not, I urge you to read this Russell Carleton’s piece on Baseball Prospectus. Assuming that The Opener strategy is a tendency that can’t be avoided at this moment in the MLB, the real point of this text is to discuss how it could be deployed on this Twins team. I figure not many fans would oppose to making that adjustment a couple of times a week, if that would represent… well, a couple of more wins a week. Right? In other words, if The Opener can make a team go from a 80-85-win team to a 86-90-win team, one would have to be stubborn to still want that strategy to be banished from the game. With that in mind, I ask you this first question: which Twins’ starting pitchers would benefit the most from having an Opener pitching before them in some games? Well, I was looking into some numbers and I was able to come to a conclusion of my own, but I invite you all to join in the discussion and share your opinions about this. Here are my candidates. Jake Odorizzi had a fantastic debut on the Opening Week, going six innings and giving up only one earned run, while also striking out eleven Cleveland batters. But then, last Friday’s outing against the Phillies couldn’t have had a worse turn out for him. He couldn’t pitch past the first inning, retiring only two batters and giving up four earned runs, three of which came from walks given up by him. I started searching a little bit in his career and I found some evidence that, in my opinion, qualify him for having an Opener pitching before him. As you can notice, his first inning numbers in roughly the last calendar year are considerably worse than the two following innings. In other words, it’s like he has been pitching much better to, say, opponents batting from #4 and lower. It’s acceptable to assume he would have a much better performance if he started the game pitching to the middle part of the lineup. In the last twelve months, Odorizzi has pitched almost four times worse in the third time he faced another team’s lineup than he has in the first time. So, he’s a perfect fit for The Opener. He hasn’t pitched well in the last year and he has run out of gas by the third time he has faced lineups. If you use an Opener with him, he would probably start pitching to the fourth or fifth batter in the opponent’s lineup. Plus, this could also improve his Third Time Through the Order numbers. In my opinion, there’s no harm in testing this. Another candidate that could really benefit from The Opener would be Martín Pérez. Maybe even more than Odorizzi. Throughout the offseason, we’ve tried to reason his signing and to think of many scenarios in which he could be a good fit for the Twins. But as of now, in his two relief appearances, he struggled, posting career high 24.3 P/IP and 9.25 BB/9, as well as second worst career S% (61%) and H/9 (11.37). As of next Friday (April 12th), the Twins will play 13 consecutive games, which would mean Pérez would be shifted to the rotation. He is deserving of an actual shot in the rotation, but if he struggles again, what should be the club’s course of action? It’s highly unlikely that he would be bought out of his contract, once he is guaranteed to receive his $ 4.25 million of salary. So, how could the Twins avoid having such weak point in their rotation? Keep him in the bullpen and shift Adalberto Mejía instead? Maybe. But you could also try The Opener. Here’s how Pérez has performed in the last calendar year. Just like Odorizzi, his first innings performance was quite bad and his TTTO numbers are more than two times worse than the first one. Using an Opener for one or two innings and having Pérez start pitching to the middle or bottom part of the lineup, could improve his numbers. Just as a comparison, here’s how José Berríos and Kyle Gibson, the two best starting pitchers of the team last year, have performed in each time through the order, in the last calendar year. The variation is not nearly as big as Odorizzi and Pérez. So, it would be a very valid move to try and use The Opener with them and see how it works. What do you have to lose? Mejía, in my opinion, should be a regular part of the rotation. I find him very talented. But, for some reason, the coaching staff decided to have him come out of the bullpen. So, with those first inning numbers, he could be a great fit to open games pitched by Odorizzi or Pérez. I really hope the goes back to being a fulltime starter as soon as possible. But, until then, I think using him as the Opener would be the best way to go. Duffey has also posted good numbers in first innings in his career. If you combine his second inning numbers, his ERA drops to 3.63. As of the third inning, his ERA increases to 5.94, which is probably one of the reasons why he has been shifted to the bullpen last year. But if he manages to start games well enough, he could be a great Opener option. Both could be used on that role or maybe just one. Bottom line is, the Twins’ rotation have that need (on Odorizzi and Pérez days) and the tools (Mejía and/or Duffey) to fix it. I say give it a shot. Odorizzi’s work in the first inning has been very good relative to league over his career. They might get shorten his starts but it is going to take a pretty good reliever to be more successful with the top of the line up. The league split ERA was much higher inning 1 than other innings at 4.79 last year. I am super tired of everyone talking about this "opener" thing like it's a new innovative way to play, invented by Bill James or something. The #4, and number #5 starter for every team for the last 50 years has been an opener. The teams that win rings are the ones that either have a bullpen that's versatile, or a group of reliable starters that keep you in games a la Zack Greinke, Greg Maddox, and Yes, Jack Morris. im just sayin....isnt that why Mejia, and later Magill are gonna be out there? The opener theory is alive in Minnesota too, we just haven't used it yet. this seems to suggest opener is less effective with Odorizzi, as cutting him off at the end of the 5th inning and scheduling a long reliever for the 6-8th innings (stacker concept). Pineda also has pitched well, but hasn't pitched deep. Agreed wit the OP that soon the roster will need additional relievers and length with those relievers. the one inning or LOOGY can't really be afforded. 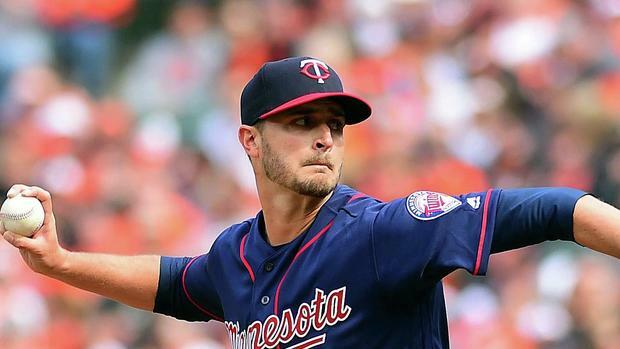 → Do Odorizzi and Pérez need an Opener?